In 2018, Oberon set out on a Walkabout to visit many friends across the world. These are his adventures. I’m presently staying with my old girlfriend Jeanné Berger, who I met at the Maryland Renaissance Festival in 1982, when I was touring with the Unicorns. She visited MG and I several times over the years, from when we were living at Coeden Brith on Greenfield Ranch, to the Old Same Place on the Rushing River. In the summer of 1990 we travelled to Alaska together, where we had many adventures. Friday afternoon I drove to Richmond, VA, to spend a couple of days with Micheline Vogt. On Sat. evening we conducted an Ostara ritual at the First Unitarian Universalist Church of Richmond. About 30 people showed up, including half a dozen kids. In addition to doing HP ritual stuff, I told stories of Spring Equinox—and the fertility Goddess in whose name we still celebrate the holiday of Easter. The kids all gathered around as I read the charming little book of “Ostara’s Hare,” by Tara Waddle, which links the Eostre Bunny with the constellation of Lepus, just below Orion. Afterwards we all enjoyed a potluck feast. Sunday morning I left early to drive over two hours to Jeanné’s place in Crownsville, MD, just outside of Annapolis. I arrived at noon, as Jeanné was setting up for “Cakes & Ale” – a splendid Medieval Feast prepared by Margaret Planetgenet and her husband Mark. The main dish was “Pecoke With Ginger Sawse.” (chicken with ginger sauce), and much excellent wine was imbibed with toasts between courses. The final beverage was Café with Jacquin’s Ginger Brandy & Coconut Milk. There were eight guests around the table; the whole package was a charity event Jeanne had purchased to benefit RESCU Foundation (Renaissance Entertainers, Services, Crafters United). Last night, after the feast, Jeanné took me out to her favorite local wine bar and coffee shop, 49 West, where we played a game of Scrabble (She won handily. Who knew there were so many 2-letter words?). Jeanné is a world-class cook, and today she made awesome jambalaya for lunch (I helped by cutting up stuff and de-shelling the oxymoronic jumbo shrimp). And now I must close this entry and hit the road for my next destination, visiting Joe Fleming in Midlothian, VA (a 3-hour drive). When I left Salem at the first of this month, all the fields were blanketed with snow. As I’m driving south into spring, flowers are blooming and buds are appearing on the trees. Moving into Spring, yesterday was gloomy and rainy. Nicolo had tickets to an intriguing immersive theatre event called “Confections” by Third Rail Projects, at the Folger Shakespeare Library in DC, which houses the world’s largest collection of Shakespeare-related materials. The main exhibit in the Library was “Before ‘Farm to Table:’ Early Modern Foodways and Cultures;” a perfect introduction which we perused before the performance. The show began at 8:00, and we were appropriately hungry! It’s hard to describe the experience, as it was so rich and personal. After a charming strip-tease introduction (from Elizabethan finery to chemises) where we stood around a long, long banquet table populated by the five actors (3 men and 2 women) in slow-motion shifting states of undress, the 48 audience members were divided into three groups of 16 and led into other rooms (normally closed to the public) in the labyrinthine Tudor mansion, where we experienced various exquisite vignettes and personal interactions with the cast—all around the central theme of the sugary confections enjoyed by the nobility during the Age of Exploration and the era of Shakespeare—and the human price of those feasts via the slave trade to supply cane sugar from prison camp “plantations” in the Caribbean. For those lovely tiered cakes, pastries, and outlandish feasts that grew obsessively popular among the aristocracy as more ingredients from the colonies became available were made possible only through the enslavement of African people. Afterwards, we got a late dinner at China Chilcano, a Peruvian Asian restaurant in Chinatown, DC. Quite a celebration of the Equinox! Today I’m leaving Nicolo and Joanne and their lovely Imagine Acres for a two-hour drive to Richmond, where I’ll be staying for a couple of days with Micheline Vogt. On Sat. we’ll be conducting the Ostara ritual at the First Unitarian Universalist Church of Richmond, where I’ll be telling stories of Spring Equinox—and the Goddess in whose name we still celebrate the holiday of Easter. Sunday I’ll be visiting my long-time sweetheart Jeanné, who I met and loved at the Maryland Renaissance Festival in 1982, when I was touring with the Unicorns (the same year I met Nicolo and later, Dona). Jeanné is a fabulous cook, and she’s preparing a special Medieval feast for a small group to which I’m invited.. She lives in Crownsville, MD, a 2 hr. 20-min. drive from Richmond. Tuesday evening’s pot-luck dinner and cacao ceremony here at Imagine Acres was just delightful! We had nine people around the dinner table: Nicolo, Joanne, Richard, Monica, Claudia, Christel, Jim, Jeanné and me. Jeanné is Sicilian, and a great cook—her bread pudding casserole with bacon was scrumptious! I’ll be visiting her Sunday for a Medieval feast she’s putting on. Cacao ceremony dinner. Monica, Joanne, Jeanne’, OZ, Claudia, Jim, Christel, Richard. Photo by Nicolo. Christel Libiot and Jim Wert have an organization called One Heart Cacao. They have conducted numerous cacao ceremonies in the Mid-Atlantic, and have a global following. They use 100% pure ceremonial-grade cacao (chocolate in its purest form). This comes from wild Criollo trees grown and processed without any chemicals, and hand-prepared by indigenous Mayan people in the Lake Atitlan region of Guatemala, where Dona and I spent a month last summer. Criollo is the wild and most ancient of three main varieties of cacao. It makes up less than 1% of the world’s chocolate, as crop yields are low. This cacao ceremony was transformationally healing for me. As my closest friends know, I have had a lifetime aversion to the smell and taste of chocolate, due to PTSD from a childhood tonsillectomy, and the chocolate ice cream they gave me to eat after I emerged from the anesthesia – which felt like burning lava down my ravaged throat. After the movie, I drove 20 minutes to visit Tamara Shepard Truitt, her husband Tom, and her son Justin, in Waldorf, MD. Another fabulous cook, she served up a Moroccan dish of lamb couscous. Her mother, Ayesha, had spent a lot of time in Morocco before she moved with Tamara to Annwfn 40 years ago to live with Gwydion. We were all enthralled at the time by the incredible stories of her wild adventures with Tamara’s father, who was an international drug-lord. Tamara was just 9 years old back then, and she fell in well with all the rest of our feral “kid pack” at Greenfield Ranch – the 5,600-acre Hippie homesteading community in the Misty Mountains of NorCalifia, founded in 1972 and still going strong, of which CAW’s Annwfn is a 55-acre parcel. MG and I were sorta honorary Aunt & Uncle to all our kids as they grew up to become fine adults. Tamara got out the enormous photo album Ayesha had assembled, and we spent hours poring over the photos of her life from infancy to now, reminiscing about those glorious days of yesteryear. There were even pictures in the album of Gwydion, Morning Glory, me and our Unicorns! So much nostalgia, and such a sweet reunion! I left Orion and Sethlan Friday, and drove down to Alexandria, VA, to visit my old friends Burt & Stephanie Johns. Burt was with CAW back in the ‘90s, and is currently hosting a Heathen Kindred called Mannaheim. A few folks came over for the evening, and Stephanie prepared a fabulous dinner. We stayed up very late reminiscing on old times, Starwood Festivals at Brushwood, and what we’ve all been doing over the past decade or two. The next day (Sunday) we got up a little expedition to the Smithsonian National Museum of Natural History in DC with Burt, Stephanie, Perris, Tani, Hal and Joe. The Metro let us out right in front of the Trump Hotel, so we had to get pics… Sadly, my favorite section, fossils, was closed for renovation. But there was plenty else to see. Worn out from a full day of walking through the many excellent exhibits, we adjourned for Thai dinner at a restaurant called Thaiphoon. 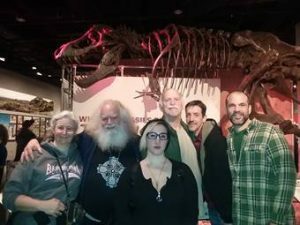 At the Smithsonian’s National Museum of Natural History… Tani, OZ, Perris, Burt, Hal, Joe. Above, Sue. After dinner I drove about an hour to Brandywine, to visit for a few days with Nicolo & Joanne Whimsey at their Imagineacres Farm. Nicolo and I had met in 1982 at the Maryland Renaissance Festival when I was touring Ren Faires with Lancelot, the Living Unicorn. He and my dear consort Dona (who I met at the Texas Ren Faire that same year) are old friends, and it was she who connected us back together. 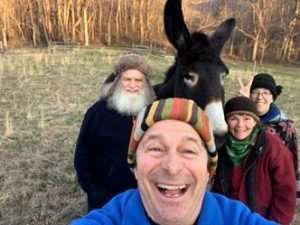 Now retired from the Faire circuit to pursue teaching, Nicolo and Joanne are long-time performers in juggling, Shakespeare, and animal acts, and they have two very sweet donkeys (Sophie and Rosa) and a beautiful horse on their 125-acre farm. Yesterday we spent some time with the equines, and took a nice hike through the farm and canyon, looking at waterfalls and fossils (brachiopods). We were joined by the Simpsons (Rick & Monica), and as seems to be the usual case, we stayed up late sharing stories and laughter. Later this afternoon I have a phone interview with Dan on Brattleboro Community Radio-WVEW-LPfm. I’ll post a link where you can hear it… Then this evening a few more friends are coming over for a cacao (chocolate) ceremony. One of these will be Jeanné Berger, one of the great loves of my life, who I also met at the MD Ren Rest in 1982. We haven’t seen each other since we traveled together to Alaska sometime around the early ‘90s. I am so looking forward to seeing her again! Tomorrow (Wed.) I’m going to visit Tamara in Waldorf, MD, which is only 10 minutes from here. When she was a little girl, Tamara lived with her mother, Ayesha, and Gwydion Pendderwen, on CAW’s 55-acre sanctuary of Annwfn on Greenfield Ranch in Mendocino County, CA. Gwydion died in a car wreck at Samhain of 1982 (that was quite a year!) – on Tamara’s birthday. Over all these years since, she’s gone off to have a full life, and it’ll be great to meet her family and catch up. Thursday I’ll be back here at Imagineacres, where Nicolo has gotten tickets for a play in the evening called “Confection,” by Zack Morris. As I understand, it’s an immersive experience, like dinner theatre. Sounds like fun! Friday I’ll be leaving lovely Imagineacres and driving down to Richmond, VA, were I’ll be staying with Michele Vogt. On Saturday, we’ll be conducting the Ostara ceremony at the First Unitarian Universalist Church of Richmond, with Michelle as HPs, and I serving as HP. I arrived at Orion’ & Sethlan’s yesterday afternoon, after a 2-hour drive from Elizabethtown, PA, where I had a nice lunch date with Chris Davis after saying my farewell to Kim in Mt. Joy, where I’d stayed for the past week. When I drove down to PA from New Jersey, it was still winter, and the ground was all covered in snow. But now on this drive a week later, the snow was all gone and the weather was warm. I feel like I’m driving south into Spring! The past week with Kim has been pretty full. I did a phone interview on Friday the 8th for the radio show “Up Close and Personal With Rev. Alfred Willowhawk.” Then on the weekend I did two bookstore gigs. The first was Saturday at Kim’s beautiful new store, Twisted by Nature, at 207 N. Market St., Elizabethtown, PA. She was just setting it up for the Grand Opening when I was here last Sep., and now it’s all up and fabulous. On Sunday Kim drove me to another book-signing and talk at Moon Raven Alley, 1398 Oregon Rd, Leola, PA, owned by Collette Wagman. This is a charming little shop in the style of an old country Witch’s cottage. 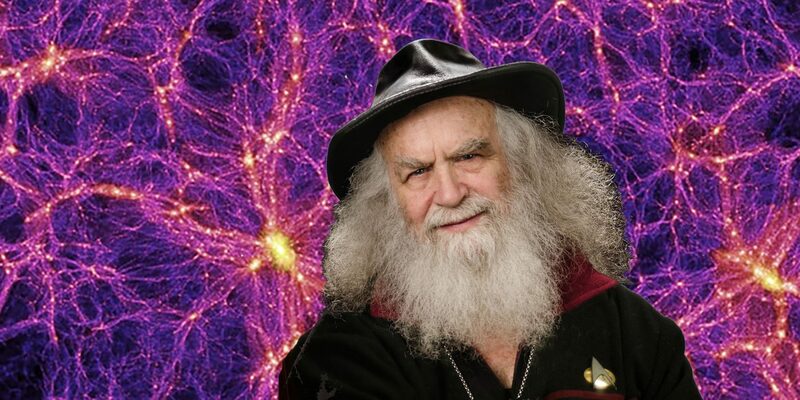 I talked for a couple of hours about Wizardry, Quantum Magick, the Awakening, the coming 2020s, and 50 years of modern Paganism. Kim and I did an Escape Room at the legendary Bube’s Brewery (founded in 1868), which was way fun! There were so many clues to unravel and decode that it really takes a larger group to accomplish them all in the given time, but we did quite well, even though we didn’t get out before the cops showed up. And yesterday – 3.14 – was “Pi Day,” and the 15th anniversary of the incorporation of my Grey School of Wizardry, of which I am exceedingly proud. I got into Kim’s place in Mount Hope, PA, early yesterday afternoon, after a short hour-and-a-half drive from Allentown, where I’d spent yesterday and last night at the home of Sandra Eckert and Peter Bourdelle. They put out the word to their circle of friends-many of whom I already know-and a couple dozen people showed up for a delightful evening of scrumptious pot-luck yummies, wine, conversation and music. Several of the folks were musicians, and Sue Wolfsong and Arthur Louis Benson II are also songwriters, so we had original music with moving lyrics. I wish Sue’s songs were available on CD; her “Butterfly” and “Gypsy Blessing” were awesome, and I want the lyrics! Sue and her partner Jonny Lee Rosenblatt, along with David Donohue and Dar, announced their engagements and intention to have a double wedding this summer! Huzzah! I’ve known Sue and David (identical twin brother of my dear longtime friend in California, Tom Donohue) for decades, and this was wonderful news. Sandy and Peter were gracious hosts, with family histories of famous artists, whose works are displayed around the house. Peter’s grandfather was Emile Antoine Bourdelle, and he worked with August Rodin! Antoine created the “Heracles” sculpture that can be seen in the Metropolitan Museum of Art, as well as a few other major museums, and there is a Musee Bourdelle in Paris. Some of the art on the walls were by Peter’s father, Pierre Bourdelle; and other lovely artworks throughout the house are by Sandy. The night before, Tues. the 5th, I got to Anthony & Xenia’s pretty late, after an afternoon of recording at Joey’s basement studio with Jimmy Clark and Liz Tapria, who is a trained opera singer. After they were done, I did a one-hour podcast with Erich Terry, but I don’t know when he plans to broadcast it. This afternoon I did a 90-minute phone interview for the radio show “Up Close and Personal with Rev. Alfred Willowhawk.” It will be broadcast later in the month. 9 Sat 2:00pm-Book-signing and talk at Twisted by Nature, 207 N. Market St., Elizabethtown, PA.
On Tues. the 12th and/or Thurs. the 13th, Kim has arranged a special VIP package: a private 1-hr. lunch with OZ at Bube’s Brewery: lunch, 2 cocktails, dessert, autographed book, autographed photo. And then on Thursday the 14th I’m driving down to New Carrollton, MD, to visit Orion Foxwood and Sethlin. Back on the road again, I’m now in Milford, CT. After a 3-hour drive from Salem, I met up here with my dear friends Cate & Frank Dalton. We’ve known each other since 1995, when they brought me out here for their wonderful Craftwise Festival in Hartford, also attended by Stewart Farrar, where I met Liza (who became a member if our Ravenheart Family). Subsequently, we became great friends over many years of Starwood festivals at Brushwood, on 180 mostly-wooded acres near the town of Sherman in upstate NY, where the Daltons had a big campsite right across from the great Saturday night bonfire. Cate is a world-class cook, and she whipped up amazing feasts for her little tribe-which I was pleased to be part of. Over the years we had many delightful conversations watching the painted dancers around the enormous fire, and I watched their three kids grow up. After Starwood moved from Brushwood to Wisteria, near Pomeroy, OH, in ?? the community was split, with many continuing to attend the Sirius Rising festival at Brushwood, held on the weekend after Starwood. I attended both festivals that first year, but since then I’ve only been able to make Starwood each year. I miss my many dear friends from those glory days at Brushwood, and it was wonderful to see Cate & Frank again, however briefly. They took me out for dinner to a Basque restaurant-a new culinary experience for me. I ordered a seafood paella, and it was fabulous! Last night it snowed rather heavily, and my little red Prius is rather buried. I should have picked up a window scraper while I was in Salem, but I used Gypsy’s there for the few times I needed it, and I thought coming this far south in March I was out of the snow. Silly me! As soon as I get the snow off my car, I’ll be heading down to Branchville, NJ, where I’ll be doing a book-signing and talk from 7:00-9:00pm at The Amber Dragon, 3 Milk St. I’ll be staying the night over a funeral parlor, which should make for some interesting dreams! 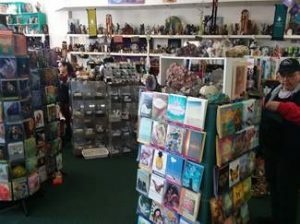 My last weeks in Salem were filled with dinners out with friends, an amazing Tarot reading from Lori Bruno (descendant of Giordano), and preparations and packing for my departure on this next leg of my continuing Walkabout. It was a wonderful sojourn in the “With City,” and a great few months with Gypsy. I carry it all with me, and I look forward to returning someday. 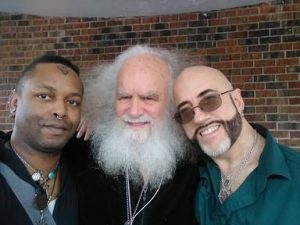 I am being sustained on this Walkabout journey (and storage fees for my extensive esoteric Library and Museum of Arcana collections) by personal appearances, fundraising events, and your generous donations, particularly via my Patreon page: https://www.patreon.com/oberonzell. Thank you for your support! I have only nine more days left of my pleasant sojourn in mystical magical “Witch City.” I’ll be driving away in my little red Prius on March 1. My first stop will be to visit my dear friends Cate and Frank in CT, whom I’ve known for nearly 25 years, when they used to put on the Craftwise Festival in Hartford. They had a large installation at Starwood every year when it was held at Brushwood, and I always enjoyed hanging out with them and their kids. It’s been awhile, so I’m looking forward to catching up. I’ll be doing some more filming with Jimmy Clark at his studio in Sayreville, NJ, for his Tarot Trumps music videos, and his covers of Gwydion’s songs. Stay tuned! After months in Salem, I’ve managed to avoid snow all winter. But finally it caught up with me. My little car had three inches of that white fluffy stuff all over it. Very pretty, and it’s melting fast enough that I don’t have to shovel it, so I can just enjoy looking at it out the window from a nice cozy fireside. A lot has happened in the 12 days since my last journal entry; I’ll try and catch you all up. Saturday, Feb. 2, was the Sabbat of Imbolc/Imbolg (Gaelic “in the belly”) or Oimelc (“in milk”), referring to the beginning of the lambing season in Ireland. Called Candlemas in the Roman Catholic Church and “Groundhog’s Day” here in New England, it is the festival of Brigit/Brigid/Bride, ancient Irish Goddess of the forge, crafts, midwifery, herbalism, poetry, and all creative endeavors. She is the patron/matron Goddess of my Ravenheart Family and Clan. Gypsy and I drove back to Goddess Mountain in Western MA to celebrate with High Priestess Lady Tiana Sophia Mirapae and her lovely Priestesses and Priests (all robed in white) in a beautiful ceremony in honor of Brigit. We wove Goddess eyes, sang songs, drummed and danced.and feasted well. On Monday the 4th I drove out to remote Tingsboro to visit with Erinna Northwind. Erinna is a terrific writer and ritualist, and contributed many writings to Green Egg, Earth First!, and other Pagan/Gaian publications. Her own lifemate died a few years ago, so we old widows reminisced over our decades and lost loves. Erinna and her two kids, Sarah and Tad, had lived with me for a few months way back in 1971, when we were still in St. Louis, before I met Morning Glory and moved to the West coast. I was with Julie at the time, and my own son, Bryan was there as well. Another family, Judy O’Rourke, and her three kids, were also part of the household (Judy died in 1993, but I’m still in touch with her daughters, Laura and Sandy). So for awhile there I was husband to three remarkable women and father to six precocious kids! Every evening I would read to them from Alan Garner’s The Weirdstone of Brisingamon (1960) and other books of magickal adventures. Once in awhile I wonder where my passion for the Earth and my acceptance of the spirit of many living things came from, and I remember those few months my family lived in St. Louis. Although I was only 11 or so, the energy of the realness of the love that flowed there colored my soul permanently. Last time I wrote to you, when my mother had passed away in 1993, I serendipitously had found a copy of the Green Egg at the bookstore, or rather it found me, and I wrote to you back then. This time, I looked online and found the Green Egg easily. I am sorry to learn that you have had to ward off colon cancer and certainly wish you well. I have been reflective in the past year or so, in particular, as I approach 50 years old, and I remember the days we stayed with Histah [my boa constrictor-OZ], and the iguana escaping into the neighbor’s trees, and playing on the rooftop, and dancing in the yard, and awesome Halloween decorations that literally scared the neighbors away…and the white rat who came up from the laundry to ask for dinner as very special weeks in my life. I am a writer, ever since the “ink bug” bit me listening to the ditto machine and collating the newsletter. Thank you for letting us live with you then. We just took a friend of my son’s in to live with us, and it seems so totally natural to do; yet, so many people say, “Wow, that’s really nice of you….” And while I don’t see it as exceptionally “Nice of us” to do, I do look back with gratitude that you opened your home and your hearts to my family when we really needed it and that even almost 40 years later, I still remember those weeks and believe they did add a great flavor to my life and myself. It was signed by Robert A. DeLeo, Speaker of the House and State Representative Paul F. Tucker. Pretty cool! In what other city than Salem would the Mayor and the Speaker of the House honor a local Witch? We’ve come a long way since 1692! After the big party, a couple dozen of us went out for seafood dinner at the restaurant, Sea Level, just down the road from Nu Aeon. Great company and conversation ’til late in the evening. Tonight is an Alexandrian ritual for Oimelc in the temple here at Gypsy’s home, Motherwit Manor. I’ve read Stewart Farrar’s What Witches Do, and Maxine Sanders’ autobiography, Firechild, and I’m really getting into this Tradition. After driving back to the Ren Faire site 45 miles north of Houston, I spent another week with Dona in her little school bus. I hope you all watched the awesome Blood Moon eclipse on Sunday night, the 20th. It was quite a spectacle! I took a Lyft to the Houston airport and flew back to Boston on Thursday the 24th. There was a huge storm which buffeted the plane like a small boat on a stormy sea as we flew into the Boston airport. The government shutdown was clearly affecting the airports, which were crowded with passengers backed up by flight delays and cancellations. If I’d scheduled my flight a day later, I might never have been able to go at all. I was met at the airport by my good friend Andy Burke, who drove me back to Salem in the pouring rain and dense traffic. What would normally be a half-hour drive took nearly an hour. It was good to get back to Gypsy’s after the harrowing adventure. While I was away, there’d been quite a snowstorm, but most of it had melted by the time I returned—except for piles of hard drifts from the snowplows. Glad I missed it! However, it’s snowing here tonight, and the temp (with wind chill) is expected to get down to 20 below zero by morning! Saturday the 26th was a wedding for the daughter of one of Gypsy’s friends, which was a wonderful event. Having performed hundreds of weddings and handfastings over the past 50 years, it’s rare that I’ve been able to attend a wedding where I am not myself officiating, and can just enjoy myself with no responsibilities. “I’m seeking experts in several specific areas. I understand that you have an expertise in magic and wizardry and I’m hoping that you might be one of the experts I’m looking for. I think the interview went well, and I’ve signed their contract. Now we’ll just have to see if their proposal gets picked up by a “major cable network.” If so, this will certainly affect my plans for the coming year! Other than the possibility of a TV gig—which would entail studio work in LA or NY, and on-location shooting—my current plans are to leave Salem at the beginning of March, driving South. I’ll be looking for people to visit, and possible book-signing and workshop gigs, in RI, CT, NYC, NJ, Eastern PA (Mt. Joy; Philly), MD/DC area (I want to visit the Smithsonian again…), VA, NC (my brother lives in Hendersonville), SC, GA (Marietta/Atlanta), FL (Orlando).